The Federal Democratic Republic of Ethiopia is a sovereign state located in the Horn of Africa. It is bordered by Eritrea to the north and northeast, Djibouti and Somalia to the east, Sudan and South Sudan to the west, and Kenya to the south. With over 100 million inhabitants, Ethiopia is the most populous landlocked country in the world, as well as the second-most populous nation on the African continent after Nigeria. It occupies a total area of 1,100,000 square kilometres (420,000 sq mi), and its capital and largest city is Addis Ababa. Ethiopia derived prestige with its uniquely successful military resistance during the late 19th-century Scramble for Africa, becoming the only African country to defeat a European colonial power and retain its sovereignty. Subsequently, many African nations adopted the colors of Ethiopia's flag following their independence. It was the first independent African member of the 20th-century League of Nations and the United Nations. 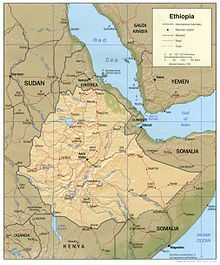 In 1974, at the end of Haile Selassie's reign, power fell to a communist military dictatorship known as the Derg, backed by the Soviet Union, until it was defeated by the Ethiopian People's Revolutionary Democratic Front, which has ruled since about the time of the collapse of the Soviet Union in 1991. Ethiopia is a multilingual nation with around 80 ethnolinguistic groups, the three largest of which are the Tigrayans, Oromo and Amhara. Most people in the country speak Afroasiatic languages of the Cushitic or Semitic branches. Additionally, Omotic languages are spoken by ethnic minority groups inhabiting the southern regions. Nilo-Saharan languages are also spoken by the nation's Nilotic ethnic minorities. Ethiopia is one of the founding members of the UN, the Group of 24 (G-24), the Non-Aligned Movement, G-77 and the Organisation of African Unity. Ethiopia's capital city Addis Ababa serves as the headquarters of the African Union.